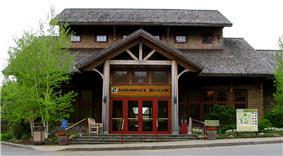 The Adirondack Museum, located on NY-30 in the hamlet of Blue Mountain Lake in Hamilton County, New York, is a museum dedicated to preserving the history of the Adirondacks. The museum is located on the site of an historic summer resort hotel, the Blue Mountain House, built high above Blue Mountain Lake in 1876, that operated until the late 1940s. Its collections include historic artifacts, photographs, archival materials, and fine art documenting the region's past in twenty-two exhibit spaces and galleries. It offers special events, classes, symposia, workshops, demonstrations and field trips. The museum contains a research library; its publication program has produced 65 books of Adirondack history, art histories and museum catalogs. The museum started as a result of an effort in 1947 to protect the steam locomotive and two cars that had been abandoned on the Marion River Carry between Utowana and Raquette Lakes. Within a year, the Adirondack Historical Association was formed. In 1953 the historic Blue Mountain House was purchased as the site for the museum, and after years of demolition and construction, gathering historic materials and designing exhibits, the museum opened on August 3, 1957. In 1963-64 the museum sponsored the archaeological exploration of the Wiawaka Bateaux Site by Terry Crandall. The museum collection includes a number of large objects, including a Pullman railroad car, several guide boats and an Idem class racing sailboat, a steam locomotive, a one-room schoolhouse, a complete blacksmith shop, the rustic "Sunset Cottage", and the Log Hotel, original to the museum's site, which is on the National Register of Historic Places. The second largest collection of inland wooden watercraft in the United States.